The latest Biblioblog Top 50 makes for enjoyable reading. I must confess that there are far too many blogs in the top 50 that I don't yet subscribe to. I'll have to put that right. It's nice to see the NT Blog still in the top 10, and even more encouraging to see the NT Pod jumping a massive 78 places to 58. It's good to see James McGrath back in the top 10, but those of you who aren't reading Paleojudaica should be. I am sure Dr Jim (Linville)'s blog will continue to rise up the list in the future. It's one of the most entertaining of all the biblioblogs, in my humble opinion. One curiosity -- I don't see Bob Cargill's blog anywhere, and it certainly should be added. And congratulations to Jim West for holding on to the top spot for the sixth month in a row. To be sure Paul had his serious limitations as a counselor. We look in vain for any sign of humor in Paul's letters. He would have been both happier and wiser if he could sometimes have laughed at and with himself and at and with others; perhaps he did, but surely not often enough, since in that case at least an occasional chuckle would have found its way into his letters. (87). The passages in Paul I discuss are Galatians 5:12, 1 Corinthians 12:15-26 and 2 Corinthians 12:11-13. For those who continued listening all the way to the end, there is a short clip of Eddie Izzard talking about Paul's letters. (Longer clip here on Youtube, with a bad language warning -- contains several expletives). There has been a lot of talk recently in the biblioblogs about audio and video in the NT Studies area, and the usefulness of new audio and video resources in teaching (e.g. AKMA and Homilia of a Budding NT Scholar, among others, commenting on St John's College, Nottingham Youtube videos). This has made me realize that it is high time that I begin the task of integrating links to audio and video resources into particular areas of the New Testament Gateway, and not just in gather-all pages like the one I recently added on podcasts. It is early days yet, but I have added pages on Historical Jesus: Audio and Video and Paul the Apostle: Audio and Video. So far, I have added links mainly to BBC documentaries and discussions (all audio streaming) and some podcasts, but next I'd like to work out how to link to some video too, including projects like the St John's Nottingham one. There is a lot more work to be done in this area, but it's exciting to have this new beginning. Suggestions, of course, are welcome. The academy has fallen too far behind in area of modern media. Television documentaries, blogs, and other self-produced vehicles of information dissemination have nearly been monopolized by entertainment brokers and scammers, who are all looking to make money by peddling popular misinformation. Scholars must venture into these less comfortable waters and begin to engage the public on their terms, for indeed, the winds have shifted and the environment of learning has shifted from the classroom to the living room. With wireless internet and satellite television pumping more information than a person can handle into homes around the world each day, an increasing number of people are getting their news and information from the internet and television rather than university campuses. At some point, the academy must relinquish its notion that the public will come to them for verification of facts and must take their message to the people. Scholars must work with university media relations personnel and technologists to maximize the reach of their research and instructional materials. And as always, scholars must publish their findings in a timely and credible manner, or they will indeed perish. Or, far worse, the truth will. In today's Campus Technology, the news that Most Faculty Don't Use Twitter, Study Reveals. Also in the news today, it emerges that bears do, in fact, poo in the woods. Michael Goulder, Luke: A New Paradigm (JSNTSup. 20; Sheffield: Sheffield Academic Press, 1989), 280. I have been looking for this quotation for ages, and finally came across it today. I had remembered using it myself (e.g. in my review of Kim Paffenroth's Story of Jesus according to L, "In the search for 'un-Lukan' features, one cannot help thinking that with a sharp enough scalpel, everything is unique"), and I had always attributed it to Michael Goulder, but I was beginning to think that I had invented it myself. It turns out that my memory was correct and that it does come in Goulder. It's a nice line. In context, Goulder is criticizing the fine distinctions made by Schürmann on Luke 3.15, "Schürmann denies the verse to Luke by fastidious distinctions . . . "
Regular readers of this blog may recognise that it repeats, deletes, adjusts and adds to some of the themes that I have been discussing here in the series on Missing Pieces. It is also my belated birthday tribute to Rudolf Bultmann whose 125th birthday was last week (see Bultmann posts and tributes). For those who are not subscribed to the NT Pod, I will continue to mention it here when I remember. The latest episode, uploaded earlier, is on Luke's Genealogy (Luke 3:23-38). In it I develop the suggestion that Luke takes his genealogy of Jesus through Nathan (Luke 3:31) rather than Solomon (Matthew 1:6) because he is developing an idea drawn the famous messianic passage Isaiah 11:1, which speaks of the "shoot coming from the stump of Jesse". I don't think I have any substantial programme notes to add this time, but it is possible that I might follow up the podcast with some notes here in due course. . . . . However, the outgoing board chair, Lane C. McGaughy, this year engineered a major money-saving relocation to the private Willamette University in Salem, Oregon, across from the state capitol. A longtime professor there, McGaughy convinced university president Lee Pelton, already a supporter of the Jesus Seminar, that the academic group and its Polebridge Press would fill the university's desire for an additional research center and an expandable university press. Mainstream and boring -- that's a quotation worth remembering for the next time I am setting an essay on the Jesus Seminar and its participants! There is more news on the Westar Institute's site. And since I have last visited their site, there is some audio and video added. Atlanta – The Society of Biblical Literature (SBL) has received a National Endowment for the Humanities planning grant to develop an interactive website that would improve public understanding of the Bible and its contexts. This website, “The World of the Bible: Exploring People, Places, and Passages” will feed the large public interest in matters biblical and will draw on the work of SBL members. The Project Director is SBL executive director Kent Richards, who will oversee the planning phase for the website from September 2009 to September 2010 . . . The press release also mentions an advisory board, which includes a couple of familiar names from Duke University. For other tributes and obituaries, follow this link: Graham Stanton. Stanton justified his early elevation to a chair and his transfer in 1998 to the prestigious Lady Margaret’s chair at Cambridge. What the publications barely show is his remarkable success as a doctoral supervisor and the unusual proportion of his time and energy spent on this part of his work. His reputation attracted research students from overseas, a welcome contribution to university budgets. The warmth of their devotion to their teacher was evident in a haka honouring his roots and support for the All Blacks at the presentation of a festschrift [sic] in 2005. 1. Find a cheap flight. This has to begin pretty early, like a month or so ago. It's a good idea to use an aggregator site like Kayak and to watch the prices daily. I have managed to find a $216 flight from Raleigh to New Orleans after having watched the site for the last few weeks, and I am feeling quite chuffed about it. 2. Room-share. The SBL hotels are all pretty posh and pretty expensive. The only way to stay in one of those hotels and keep the price down is to room-share. Of course you need to have a person or people that you can cope with for several days, but the lucky ones among us will actually enjoy the SBL a great deal more because of the company they keep. 3. Breakfast trough-out. The cost of food is a big problem, and four days of conference-attending can put the strain on your budget. 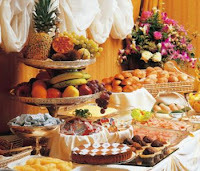 What I suggest is to get to one of those great American breakfast buffets every morning and eat to your heart's content. Don't be put off by earnest looking professor types who only visit the buffet once. Keep going for as long as you can. Eat so much that you won't want lunch. You can then make it through to the evening when you'll be just peckish enough to enjoy something else. Birmingham never gave me enough to travel, and so troughing my face at breakfast was my standard survival strategy. The American breakfast buffets are great, though for Brits it can be a little off-putting to see Americans putting their fruit on the same plate as their sausage and bacon, or worse, putting corn syrup on their scrambled egg. So Brits abroad may need to avert their eyes. There is also an unappetizing pastey coloured concoction called "grits", which is to be avoided. 4. Get invited to receptions. Even if you have troughed out at breakfast, you'll be hungry again by the evening. If you can, get to an evening reception where there is a lot of food. Unfortunately, publishers and universities are all feeling the pinch, and the amount of "free" food at the receptions is now pretty limited, let alone free drinks (e.g. Duke goes to a cash bar this year for the first time in recent history). Nevertheless, if you are not too fussy, you might be able to pick up some nick-nacks while networking. 5. Don't visit the book exhibit. If you do, you will probably end up buying books. You know you can't afford them, and you run the risk of weighing down your bags so much that you have to pay extra at the airport for the journey home. And all these scholars who write big books have got plenty of money anyway, and don't need additional royalties from an SBL-on-a-budget type like you. Bear in mind that they won't be flight-watching, room-sharing, breakfast-troughing and reception-grabbing. The last thing you want to do is to subsidize their luxury. This one is written by John Sentamu, Archbishop of York, hence the title, and it echoes the same comments about John Sweet's delightful character, but it has a nice paragraph on John Sweet's commentary on Revelation. Academically, his commentary on the Book of Revelation was both wise and balanced, and played a very important role in helping ordinary readers make sense of this strangest and most puzzling part of the New Testament. He tried to see it as a whole, without the distortions of inherited assumptions. Drawing on the latest scholarship, Sweet explored the literary and theological dimensions of the text with great skill and lightness of touch, with the commentary serving as a reference point for students and scholars ever since its publication in 1979 by SCM Pelican Commentaries. John Sweet was a highly respected New Testament scholar who gave his life to teaching generations of students at Cambridge, among them three current Archbishops: Canterbury (Rowan Williams), York (John Sentamu) and Wales (Barry Morgan). He was totally without self-importance and to many seemed to epitomise the words from St John’s Gospel, “full of grace and truth”; 194 people attended his retirement dinner, including four diocesan bishops. For although Sweet was a distinguished scholar, at the centre of all he did, suffusing it with a special quality, was a sense that first of all he was a priest and a Christian disciple. His influence on all he taught was deep and long lasting. It's there on the third line, chi, iota, stigma (hexakosiai deka hex). For a useful video introduction to the issues, see my post from yesterday, Number of the Beast: 666 or 616: how does it work?, which features Ian Boxall and David Parker. For an earlier post on the topic here, see The Number of the Beast: 616 and Oxyrhynchus. I may add a bit more here in due course. Number of the Beast: 666 or 616: how does it work? The experts used in the discussion are Ian Boxall of St Stephen's House, Oxford, and David Parker of the University of Birmingham. The latest In My View is now available at Bible and Interpretation. This week, Philip Davies writes on Watch Your Language!. Venetia Phair won fame in 1930 when she suggested that a newly discovered far-distant planet in the solar system should be called Pluto, after the classical god of the underworld. She was 11 years old. The ninth planet in the solar system had just been discovered by Clyde W. Tombaugh, a young American working at the Lowell Observatory in Flagstaff, Arizona. It was 8.05am on March 14, 1930, and Venetia Phair, née Burney, was taking breakfast with her mother and grandfather. Her grandfather, Falconer Madan, the retired head librarian of Bodleian Library in Oxford, was reading the newspaper. As he turned the pages he came across the report about the ninth planet, as yet unnamed, and how it had been captured by camera for the first time. The murky images vindicated those who, since the 19th century, had believed that another planet lay beyond Neptune. With a shrug of her shoulders Phair also told the film-makers: “And the whole thing stemmed from that.” . . .
Venetia Katharine Douglas Burney was born in Oxford in 1918, to the Rev Charles Fox Burney, professor of Interpretation of Holy Scripture at the University of Oxford and Ethel Wordsworth Burney. So Venetia Phair, it turns out, was the daughter of C. F. Burney (1868-1925), a scholar renowned for his interpretation of both Testaments, and perhaps most famous for his influential book The Poetry of Our Lord: An Examination of the Formal Aspects of Hebrew Poetry in the Discourses of Jesus Christ (Oxford: Clarendon, 1925), though also well known for The Aramaic Origin of the Fourth Gospel (Oxford: Clarendon, 1922), the latter available in toto on archive.org and Google books. Sadly, C. F. Burney had been dead for five years when his daughter named Pluto. But her grandfather (and Burney's father-in-law), Falconer Madan, who is credited in the story above, was at the time "finalising his definitive bibliography of Lewis Carroll", according to a certain Selwyn Goodacre in Lives Remembered. Professor Graham Stanton, who died on July 18 aged 69, was Lady Margaret's Professor of Divinity at Cambridge from 1998 to 2007 and before that spent 21 years as Professor of New Testament Studies at King's College, London. I made available the latest NT Pod earlier this week, NT Pod 7: Simon Peter in Matthew's Gospel. It's the first time I have done a kind of "sequel" episode, this one following on from NT Pod 5: Simon Peter in Mark's Gospel. In this latest piece, I explore the way that Matthew works with Mark's portrayal of Peter and suggest that we can see the same "Peter Pattern" here as we see in Mark. As in Mark, the "rocky ground" Peter is the one who enthusiastically receives the word with joy but stumbles when trouble or persecution arises on account of the word (Mark 4:16-17 // Matt. 13:20-21). Matthew takes forward the characterisation of Peter as the disciple who is scandalized by the idea of "Christ crucified" (1 Cor. 1:23), and he underlines and enhances the same language of skandalon and skandalizomai ("stumbling block", "to fall away"). Far from whitewashing the disciples, Matthew in fact proves to be a strong reader of Mark, understanding and elaborating on his presentation. One of the reasons that we fail to see this is our over-reliance on redaction-criticism, and our tendency only to pay attention to the parts where Matthew differs from Mark; we do not take seriously the elements that Matthew takes forward and underscores in Mark. The essay has been available in the above Festschrift for Henry Wansbrough for the last three years, but I am happy now to make it available free for all on the internet. It's true -- Michael Pahl is back! It's still called The Stuff of Earth, but it's now on Word Press, and there are other changes. I, for one, am looking forward to seeing what Michael has in store. The NT Blog and the NT Pod finally get ref-tagged! I have been meaning to add Logos's RefTagger to this blog for as long as I can remember and finally I have got round to it. The gist is that you add a little bit of code to your template, and it automatically brings all your Biblical references to life. So if I want to refer to Mark 15:39, for example, reftagger hyperlinks the reference and sends it to bible.logos.com. It does it with whole passages too, e.g. Matthew 1:1-17, and it seems to work in a range of formats, e.g. with either the dot (Matthew 1.1-17) or the colon. Impressive, huh? I've added it to the NT Pod's web page too, where I always list the key texts for each podcast in the given entry. The radical Paul of Borg and Crossan is not really very radical at all. This becomes painfully clear, among several other instances that could be adduced, in their contorted exegesis of Roman 13:1-7, Paul’s infamous exhortation to obey ruling authorities—read the Roman imperial regime—because they are “ordained of God,” who has given them the sword to enforce law and order. Borg and Crossan explain that Paul feared his Roman audience would resort to “violent tax revolt” against Rome: “Paul is most afraid not that Christians will be killed but that they will kill, not that Rome will use violence against Christians but that Christians will use violence against Rome.” This danger of violent revolt whips Paul into a “rhetorical panic’ and causes him to “make some very unwise and unqualified statements with which to ward off that possibility”—the possibility that church folk in Rome would use their marginalized, persecuted faces to scuff the brass knuckles of Roman state terror. The hermeneutic here would be hilarious if Paul’s “statements” in this toxic text were not so “unwise and unqualified.” With radicals like this, who needs reactionaries? That is only a brief snippet, though, and I encourage you to look at the whole article, which also draws in Pope Benedict XVI's and other's recent treatments of Paul. Following a hint from Michael Halcomb, I have decided to back up my entire blog, all six years or so of it, and have used the utility he suggested, Blogger Backup. I used to have all the blog files located on my own web space at NTGateway.com, and I would back up that entire site from time to time, but now have them all on blogger, so decided that it would be a good idea to keep a local back up of the blog archive. In the light of recent hacker activity, I would recommend others taking similar action. Unless Doug Chaplin is in the middle of an elaborate hoax on himself, it seems that his clayboy blog is the victim of a hacking attack. Sympathies, Doug, and I hope that all will be back to normal soon. In the mean time, a reminder to us all of the dangers of such things. Heck; has anyone got any guidance on how to avoid such attacks? A correspondent thinking of starting a new blog recently got in touch and asked me a series of questions, and he has encouraged me to post my answers here. These are very much my own perspectives on the issues from my own experience, and others will feel quite differently, I am sure, so please feel free to blog your own responses to these questions, or to add a comment below. 1. Which is the best site to go with--or does it make a difference? Blogger is, I think, simpler to use and you can have your blog up in minutes. It is pretty efficient and is fine for what most people need from a blog. However, I do think WordPress is the superior product and I have very much enjoyed using it for the new NT Gateway and NT Gateway blog since I went into partnership with Logos for that site. For my NT Blog, I am fairly happy with blogger, which I have used since 2003. For the NT Pod, I went with blogger for the "shop front", as it were, though the audio files themselves are all located elsewhere, and I slightly regret that decision. Word Press is the superior product for podcasting, it seems to me. 2. I would like to blog about three things--Bible, ministry and Macs. Is it best to have three separate blogs? Well, people feel differently about this one. I like to keep one blog for academic stuff and one for the rest (the Resident Alien) in which I talk about things connected with the life of a British expat in the US, and some other stuff of personal interest. I do this because I don't assume that people who want to read the academic stuff necessarily have any interest in things that happen to interest me, like The Prisoner, Doctor Who, and Abba. Similarly, there are those who are interested in some of that stuff but who could not care less about academic NT studies. But it's very much an individual thing. Some like to combine everything into one blog, and that clearly works for them and for their readers. My guess is that there will be those interested all three of those things, Bible, ministry and Macs, and so a one blog approach might be best. 3. What about name registration? I see you have stayed with having .wordpress but others have their own names for their blogs. Is this straightforward? Well, we have retained ntgateway.com for the NT Gateway site, but yes, I have a .blogspot address for the NT Blog. I actually find hosting on blogger much easier than hosting on my own site. Blogger updates incredibly quickly. Holding all the archives on my personal space and publishing via FTP sometimes took a very long time. The most straightforward thing, I would say, is simply to publish on Wordpress or Blogger's own sites, and so to have a .blogspot or a .wordpress address. And the massive advantage there is that it is free! Bible and Interpretation continues its In My View series of op-ed style pieces with a second and fascinating entry from Robert Cargill, On the Curious Protests of the Dead Sea Scrolls Exhibition in Toronto. I was sorry to read about the death of Paul Hollenbach at the weekend (Controversial Theologian Pushed for Critical Study of the Bible). Hollenbach (83) taught at Iowa State University's dept of Religious Studies and published several articles on the New Testament including "Social Aspects of John the Baptizer's Preaching Mission in the Context of Palestinian Judaism" in ANRW (1979) and "Jesus, Demoniacs, and Public Authorities: A Socio-Historical Study" (Journal of the American Academicy of Religion 49/4 (Dec. 1981): 567-88 and "The Historical Jesus Question in North America today" in Biblical Theology Bulletin 18 (1988): 11-22. Over on Bible Films, Matt Page notes (from Peter Chattaway) that there may be a new version of Jesus Christ Super star in the works. As a fan of the original 1973 film ("Do you think you're what they say you are? "), I have the same mixed feelings about a new version as I have had in the past about popular culture's search for big money reboots (e.g. The Prisoner, Doctor Who, and the music of Abba, just to list my obsessions). I would be delighted if it works, but ready to pour scorn if it does not. One of the things that may make Jesus Christ Superstar difficult to recreate for the big screen now, though, is that it is such a period piece. Norman Jewison's 1973 film works because it is so much of its time, and made within only a couple of years of the musical's theatrical debut. On the other hand, theatrical productions have continued now for nearly forty years, and they remain popular, so it will be interesting to see if they can pull it off for a new Superstar. And since the composers (Andrew Lloyd Webber and Tim Rice) are still alive, perhaps they could be called upon to do a few updates? A new song or two? That would be interesting. The other element of curiosity on the Bible Films blog deals with Him, the gay Jesus film. Matt has more to confirm what has become increasingly clear over recent years (See Gay Jesus Film Hoax?) that this is not a hoax. It's probably one of the worst marketed films of all time, though. Imagine a film, with a topic as controversial as that, making so little impact that people wonder seriously whether the film even existed. Fans of Wright's work will find the piece a robust and engaging summary of familiar themes from his work on the resurrection, like the claim that the ancients found resurrection as perplexing an idea as we do ("we all know that dead people don't rise. Actually, the early Christians knew that too") but there was one element that appeared new to me, the idea that "The other "raisings" in the NT are of course what we would call 'near death experiences' – people who are clinically dead and then find themselves called back," but it is possible that I have missed that in Wright's writings. A couple of other things occur to me. The first, underlined for me all the more after reading James McGrath's post today on Preach your doubts, is that I am quite taken aback by the degree of confidence that Wright has in his historical analysis. For those who do not share the same degree of confidence, the certainty expressed here, the repeated "of course" (x 6 in a short article), may perhaps be tough to handle. I wondered too whether this kind of vigorous response quite met the more impressionistic jottings-style commentary of Rutherford's original piece in his ongoing response to the Alpha course he is attending. *The Alpha Course is a popular British evangelical week-by-week introduction to the Christian faith, usually consisting of a talk, a meal and some discussion.